On May 5, 1997 We started our humble offering Internet access services primarily for tourists and business travelers. Initially, when they first originated the idea of using Internet services in this mythical magical island, we were hopelessly lost Because the Internet does not mean a suggestive link with the culture of Bali, and the grace and inherent beauty of their land and its inhabitants. However, given the possibility popular with modern technology, we thought it would be an appropriate step for many who travel around the island. We began to interpret technology and magic of Bali, both the creation of computers completely open environment and warm, with hints of Bali, the greens and natural areas, and flowers. 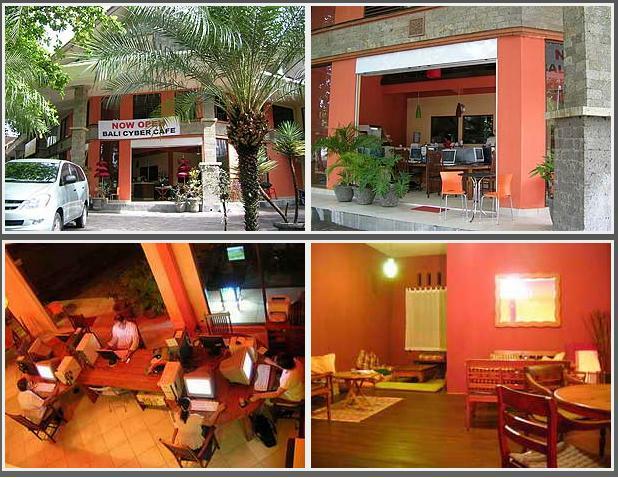 The concept of our place was not May 5, 1997 We started our humble offering Internet access services primarily for tourists and business travelers. Initially, when they first originated the idea of using Internet services in this mythical magical island, we were hopelessly lost Because the Internet does not mean a suggestive link with the culture of Bali, and the grace and inherent beauty of their land and its inhabitants. However, given the possibility popular with modern technology, we thought it would be an appropriate step for many who travel around the island. 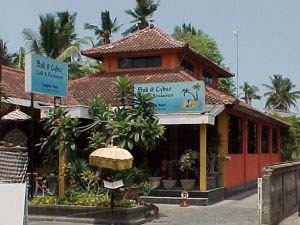 We began to interpret technology and magic of Bali, both the creation of computers completely open environment and warm, with hints of Bali, the greens and natural areas, and flowers. 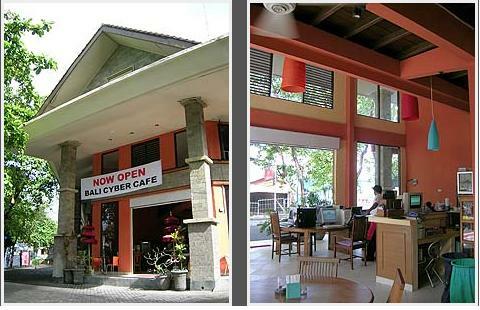 The concept of our place was not based on a cafe or restaurant are common in Bali. Our facility is different, very modern, high quality service with a personal touch, the different sections that correspond to the computer, cold room for a simple meal or a group of functions, all in the best tropical environment. It has the latest computer devices that consumers can do their work or simply surf the Internet using VoIP or chat with others on the network with the Web Cam. Have always been many other advanced technology, adding time to time, for example, certain Wi-Fi, voice over IP, recording high Our facility is different, very modern, high quality service with a personal touch, the different sections that correspond to the computer, cold room for a simple meal or a group of functions, all in the best tropical environment. It has the latest computer devices that consumers can do their work or simply surf the Internet using VoIP or chat with others on the network with the Web Cam. Have always been many other advanced technology, adding time to time, for example, certain Wi-Fi, voice over IP, recording high-resolution scan DVD, color laser printing, etc. We provided high quality food with a strong emphasis on hygiene. Much of the menu contains a balance of variety with the awareness of nutrition, with the help of the science of cooking. We have many satisfied customers pampered with a nice cappuccino with a strong and healthy snack together while surfing the net. We also conducted cooking classes and received many comments. Visit our coffee. Here you can see the new home which we made in late April 2006. These photos, taken recently, shows some of the buildings and interiors. Once you enter through the main entrance through which definitely the experience of the open concept of the cafe / restaurant. There is an upper floor containing several sessions, two computer terminals, a small library and a chill-out zone, the “lesbian”, which means sit on cushions and mats. We provide thoroughly modern eight computers (2, including some of the Mac) and two laptops for our customers. Each computer terminal is equipped with all services, for example, a real capacity audio / video, CD or DVD recorders, network printing, programs, etc. all running applications. as safely as possible to ensure the unwanted intrusion and viruses or worm attacks. Chic, Cozy & Convenient Experience! Where Blend Work & Leisure! We use wireless radio waves to provide high bandwidth and bustle of productivity because the technology is reliable and is the only economic solution to Bali for the connection to the Internet 24 hours without interruption. Our microwave radio links using frequencies from 2.4 GHz radio and offer reliable performance speeds of 256 kbps in the WLAN. The “line of sight” between the cafeteria and our ISP is only less than 1 km, an optimal range to reduce interference and additional relay point. Our antenna is placed at a point high above the cafe and the connection to its sister satellite in our ISP. We have this pair of antennas that function as an important communications center totally dedicated links. Ethernet is used for our family of local area networks (LAN) switches data on rates of twisted pair cables at 10 Mbps 10Base-T and 100 Mbps Fast Ethernet. There is a wireless access point using 802.11 b / g Wi-Fi that provides an environment that includes 11 Mbps, 54 Mbps to 108 Mbps for mobile users. Wi-Fi WPA2 encryption is secured by the DHCP service. For those without wireless capability is a network of additional sites on the second floor which allows connection to the Internet. We use a print server to handle three networked printers, allowing printing of not only our computer terminals, but also on their wireless laptop. All Internet traffic into and out of the cafeteria is at hand for a router with a hardware firewall. Eight terminals provide broad for maximum comfort and privacy, 6 hectares Microsoft Windows XP PCs and two Apple Mac OS X. You can order a drink or a snack or a healthy meal while using your computer. Ban smoking in front of the terminal EACH. 3 printers are installed modern and fast and controlled by an external print server, which offers the possibility of networking with all the features for the LAN and use of Wi-Fi can also print directly from your laptop via a wireless connection to any of our printers. For high-quality scanning of documents, photographs, as well as slides and negatives, we installed a performance HP Scanjet 5470c scnner high. At a resolution of 2400×2400 dpi color depth 48-bit hardware. Active transparency adapter is used for scanning slides and negatives. – Stereo headset with microphone for voice over IP, chat, Skype, video conferencing, etc. – Each team is equipped with a 52X CD burner. – USB Card Reader SD Memory Card, SM, CF, MMC, MS, XD, etc. – OCR documents, either as text or spreadsheet. – Typing (in Bahasa Indonesia and) we charge per block of 200 words. – Preparation of the Charter of the head, PDF resume talks, invoice templates, etc. – Graphic design, catalog design, digital imaging retouching etc. – fruit juices and healthy vegetables – freshly squeezed to order sugar or preservatives!